Acrolinx natively supports the OLIF and ACTIF formats, but you can also import or export terms in custom XML-based formats with transformation style sheets. The main advantage of XML-based formats is that there are fewer mapping steps required when importing terms in the term import wizard. ACTIF (Acrolinx Comprehensive Term Interchange Format) is the native terminology exchange format for the Acrolinx Terminology Manager . ACTIF has a similar structure to most standard terminology exchange formats such as TBX (Term Base eXchange). You can use the ACTIF format to exchange terminology between different installations of Acrolinx. OLIF (Open Lexicon Interchange Format) is an open standard for lexical and terminological data encoding and is implemented as an XML Schema and an XML DTD. To learn more about the OLIF schema, visit the OLIF website. You can also import or export almost any other XML-based terminology file by using transformations to convert the file into the OLIF format. You Acrolinx project consultant can help you create a style sheet that transforms your preferred XML format into OLIF. Convert an XML-based terminology file into the OLIF or ACTIF format during the import process . Convert an OLIF or ACTIF file into another XML-based terminology file during the export process . Transformations are configured based on your data model and individual file transfer requirements and delivered with your guidance package. If your data model changes (for example by adding or renaming custom fields), the transformation files must be adapted to reflect these changes and to ensure a correct export of the data model. If you are unsure of which transformation to use, or there are no transformations available for your file format, contact your Acrolinx Server administrator. You can use transformation style sheets to import or export XML files that are not in the either of supported OLIF or ACTIF formats. If you have created a new transformation style sheet or have received a new transformation style sheet from your Acrolinx project consultant, you can update your installation by copying the new style sheet to your server installation directory. By default, the transformation style sheets are stored the ​d​a​t​a directory. You can also specify an alternative location by using the core server property terminologyManager.transfer.transformationPath . This path is relative to the directory: ​<​I​N​S​T​A​L​L​_​D​I​R​>​\server​\bin . Copy the transformation style sheet to the directory where transformation style sheets are stored. If you are adding a transformation style sheet for the ACTIF file format, ensure that the file name contains the word "actif". For example, the file name "actif-import-transformation.xsl" is a valid file name. If the file name does not contain the word "actif", the transformation will not be detected as a valid ACTIF transformation. If you manage your terminology in a spreadsheet application, you can save it in CSV format and import it into the Acrolinx Terminology Manager . Since there is no formal standard for storing terminology in a CSV file, or for the CSV format itself, there are a number of factors to consider before beginning a CSV file import. A CSV file accepts an arbitrary range of values for column headers and cells. 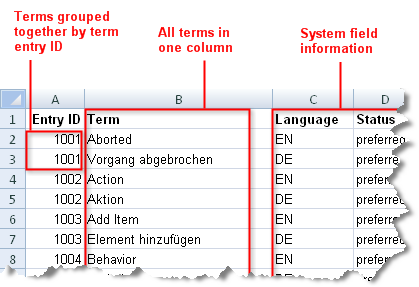 When importing CSV files into the Terminology Manager for the first time, there are several steps to confirm or define the identity of all columns, and values within the columns (these steps are often not necessary when using XML-based terminology interchange formats like OLIF, ACTIF or TBX). The term import wizard provides two CSV format options: CSV and CSV (Translations only) . The CSV option is the standard option for importing new terms from a CSV file. If you have exported a CSV file from the Terminology Manager, and have added extra translation columns, you can use the option CSV (Translations only) to import the new translated terms into existing term entries. You can use this format to continue editing your source terms in the Terminology Manager while they are being translated externally. The CSV (Translations only) option ensures that the source terms in the CSV file are ignored, and that only the terms in the target language are imported. The new translated terms are added to existing term entries based on the term entry ID in the import file. The Format-specific Options appear on the Import Options page and the Export Options page . Use the advanced CSV options to make sure the Terminology Manager interprets or exports your CSV file correctly. Has header Yes Inform the Terminology Manager if the first row of your CSV file contains column headers. Delimiter , Select the character that separates field values in your text file. List delimiter ; Delimit a list of values for fields that can accept multiple values. The field Domain can accept multiple values per term. You can use the value list syntax ​Demo​;​Switches​;​A​C​M​E to add your term to the three domains. If you do not set a list delimiter, the Terminology Manager would interpret the value ​Demo​;​Switches​;​A​C​M​E as one simple domain name. Text qualifier " Select the character that encloses values in your text file. When the Terminology Manager encounters the text qualifier character, all of the text that follows that character and precedes the next occurrence of that character is imported as one value, even if the text contains a delimiter character. If the delimiter is a comma (,) and the text qualifier is a quotation mark ("), the value ​"​Smith,​​ ​John​" would be imported into one field as ​"​Smith,​​ ​ ​ ​ ​ ​ ​ ​ ​ ​ ​ ​John​" . If you do not specify a qualifier or if you specify the apostrophe (') qualifier, the value ​"​Smith,​​ ​John​" would be imported into two separate fields with the values ​"​Smith​" and ​"​John​" respectively. Use text qualifier Yes Instruct the Terminology Manager to detect text qualifiers. Comment delimiter # Select the character that hides comments in your CSV file. You can use comments to store meta information about the contents of the file. If you use the comment delimiter (#), the Terminology Manager ignores any text contained between two (#) characters. Use comments No Instruct the Terminology Manager to detect comment delimiters. When using the term import wizard it is important to understand how the term entries in your CSV file are structured. The structure of your CSV file influences how you use the term import wizard. For every term, the term import wizard requires system field information such as language and status. Some file structures contain this information already, and other file structures require this information to be set globally. If your CSV file has several columns which contain terms, you must configure the system field information separately for each term column. The following examples show common CSV file structures and the main system field configurations necessary to import the file. 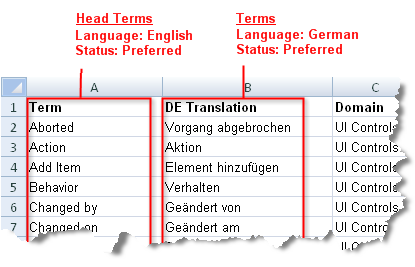 Since there are no language or status columns in the file, the language and status of the terms must be configured globally for each column. Note that the status is configured differently depending on the column. Again, since there are no language or status columns in the file, the language and status of the terms must be configured globally for each column. Note that this time, the language is configured differently depending on the column. 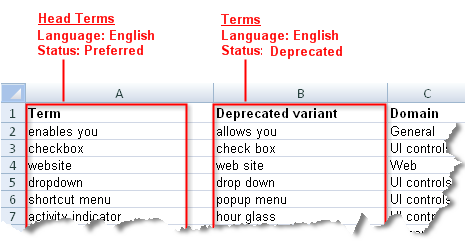 The language and status of the terms is provided in secondary columns. The only global setting for this type of structure would be the source language which defines the head terms. In this example, you could set the source language to English which would mean that 'Aborted' is selected as the head term for the term entry '1001'. 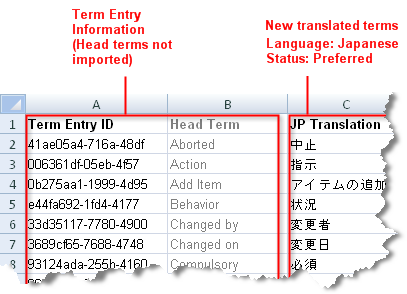 The term entry ID is used to import the new Japanese terms into the existing term entries. The head terms are present to assist in translation only and do not get imported. The status and language are configured globally for the column 'JP Translation'. Tip: Use the format option CSV (Translations only) to import this type of CSV file. When using Excel to transfer terms that are not in Western scripts, save the import file as a Unicode Text (.txt) file, not as a CSV file. NOTE: When saving the file, you must specify Unicode Text, not simply Text. When importing the file into the Terminology Manager, edit the advanced CSV options, and set the encoding to UTF-16 (or UTF-16LE), and set the column separator to <tab>.